To overlay contours on top of other contours (and possibly those on top of maps), you can either use the overlay procedure (which can also be used to overlay other things like vectors and streamlines), or the special plotting function gsn_csm_contour_map_overlay. This page also shows how you can create different types of contours for more meaningful plots, like dashed line contours, shaded contours, and stippled contours. If you plan to overlay multiple types of plots on a map plot, the prefered method is to use the overlay procedure. conOncon_1.ncl: A typical contour on contour plot. Note that this data is already on pressure levels. 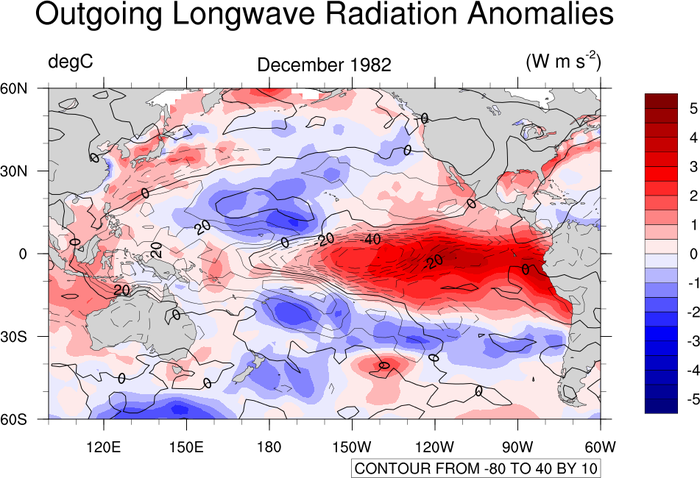 If this were model data, it would be necessary to interpolate from hybrid coordinates to pressure levels. Use gsn_csm_pres_hgt and gsn_csm_contour. Then overlay(plotu,plotv) will overlay the two plots. At this point NCL only sees one plot, plotu since it was listed first, so now if we draw plotu, we will get both plots. gsnContourZeroLineThicknessF doubles the thickness of the zero contour, and gsnContourNegLineDashPattern dashes the negative contours. conOncon_2.ncl: This example shows how to overlay several contour objects over a map background. gsn_csm_contour_map_overlay is the plot interface that overlays contour objects onto a map background. Note that this function sets the zero line thickness to 2.0 and sets all other contours line thickness to 1.0. This will override whatever thicknesses you have set. 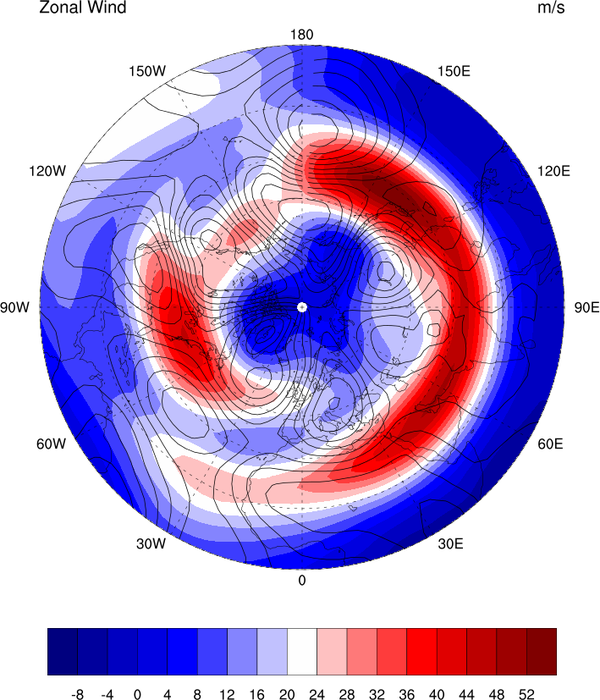 conOncon_3.ncl: Contours over contours in a polar projection. cnLineThicknessF = 1.5, Changes the thickness of the contours. conOncon_4.ncl: Adds stippling to a plot. Can be slow. conOncon_6.ncl: Demonstrates the addition of a legend for a contour-On-contour plot. gsn_legend_ndc is the function that will add a legend to a contour plot. conOncon_7.ncl: Spaghetti plot (data with 2D coordinates). 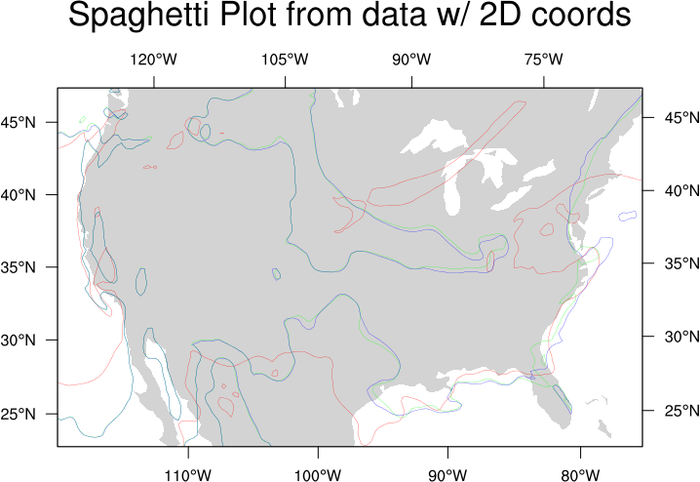 Data with 2D coordinates require extra steps to create an overlay spaghetti plot. 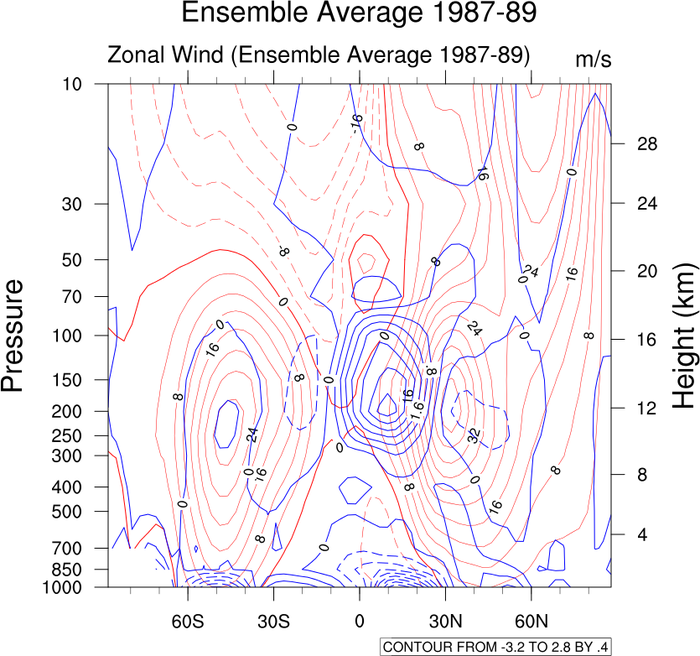 You must use gsn_contour for the contour portion of this plot. See the sample script for all the details. This data just happens to be on a native grid projection. This is just one type of data that usually has 2D coordinates. The techniques in the loop will not change for data that is not on a native grid. conOncon_8.ncl: A color significance plot. The difference between this example and example 2 is the order. The color fill must be drawn first and then the contour lines added. This goes whether the significance is colored magenta or gray. The issue is a solid fill versus a pattern fill (stippling). 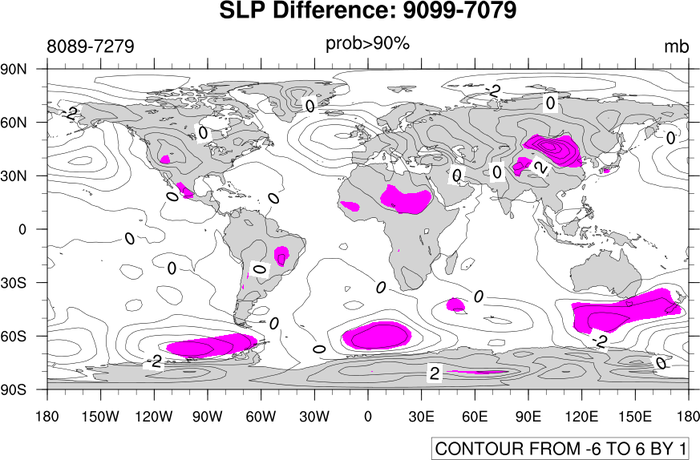 For a "B&W" plot, replace magenta with gray and turn off the continent fill by setting mpFillOn = False. 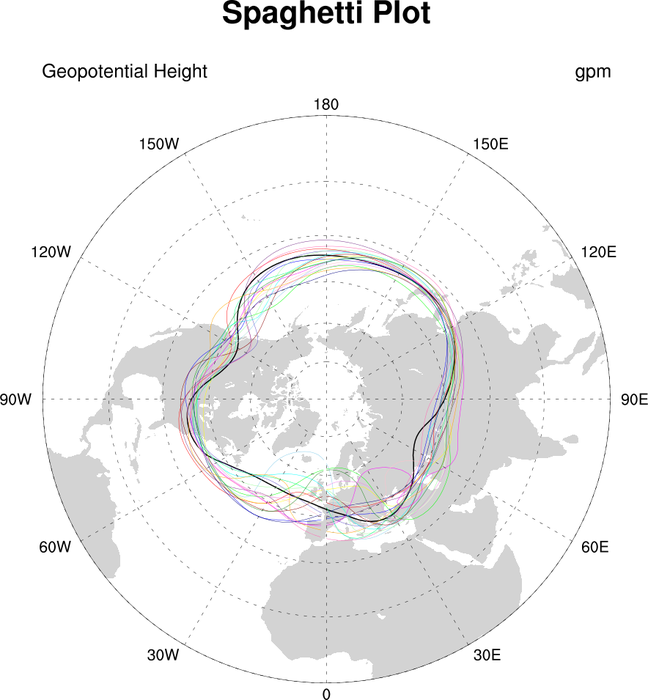 The overlay function is used to do the multiple contour overlays, and the special lat2d/lon2d attributes are used to indicate there are 2-dimensional latitude/longitude coordinate arrays. conOncon_10.ncl: This example shows how to overlay precipitation contours on a terrain map, each with its own color map. For the two lowest precipitation contours, the colors are set to transparent. Since two color maps are used here, one of the labelbars is drawn horizontally, and the other vertically. 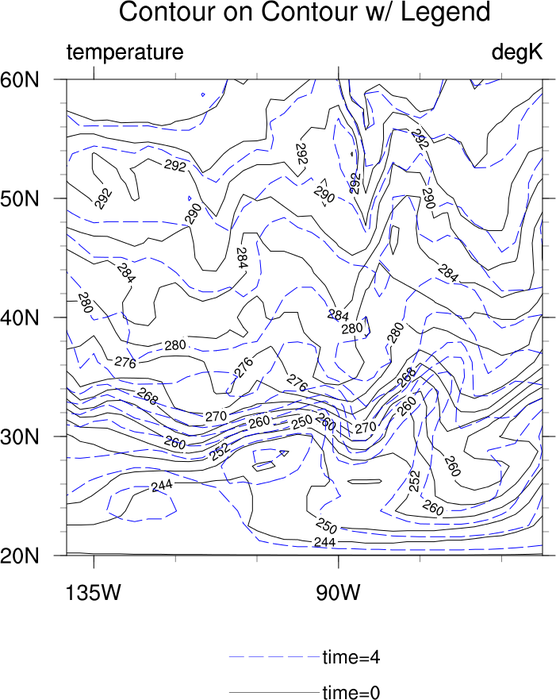 This example is similar to the WRF_pcp_1.ncl example, except it uses "gsn" functions to create the plots, rather than "wrf" functions. 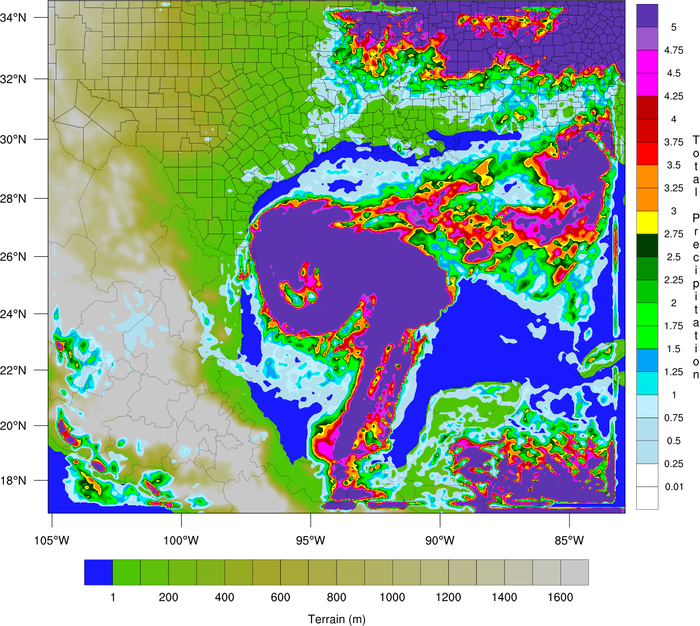 The special wrf_map_resources function is used to set the correct map projection. The overlay function is used to do the overlay of precipitation. 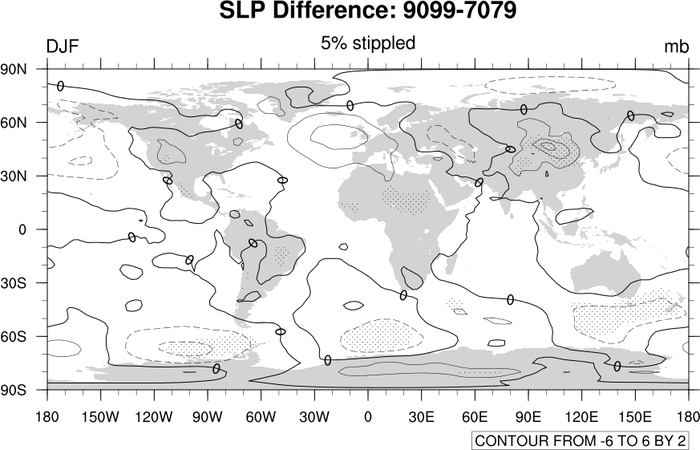 The special lat2d/lon2d attributes are used to indicate the latitude, longitude positions of the data. Thanks to Dr. Craig Mattocks at the Center for Environmental Modeling for Policy Development, UNC-Chapel Hill, for providing the inspiration for this example and helping fine-tune it.